CSUN President Dianne F. Harrison greets donors at the annual President's Donor Appreciation Luncheon. Photo by David J. Hawkins. During his introduction of student Frida Endinjok, Heritage Society Chairman David Malone ’81 (Accounting) pays tribute to Chris Smith ’64 (Home Economics) and Owen Smith ’65 (Theatre), M.A. ’67 (Drama), who left an estate gift to further nutrition research at CSUN. Photo by Luis Garcia. Junior Frida Endinjok describes her community gardening initiative, Let’s Grow Healthy, and her desire to follow in Chris Smith’s footsteps to further nutritional science and practice. Photo by Luis Garcia. 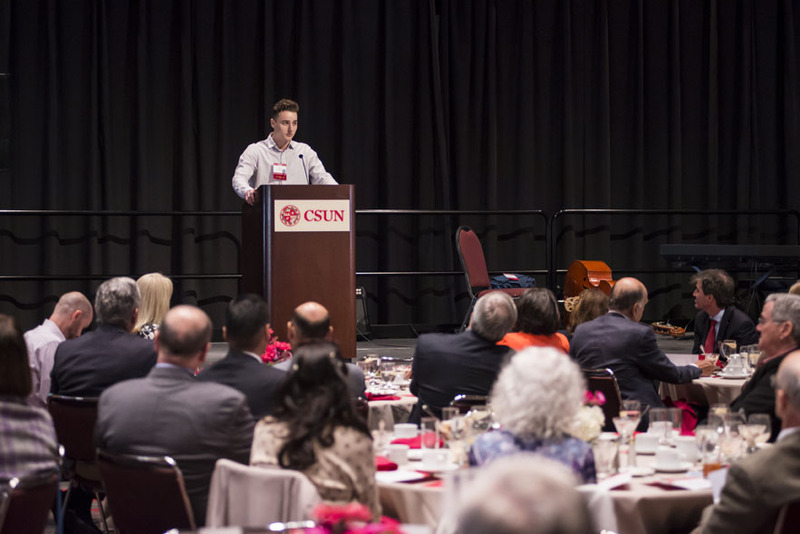 CSUN sophomore Wyatt Samuelson tells his story of rising from a challenging family situation to becoming a first-generation college student, to a rapt audience of donors at the annual CSUN Donor Appreciation Luncheon. Photo by David J. Hawkins. 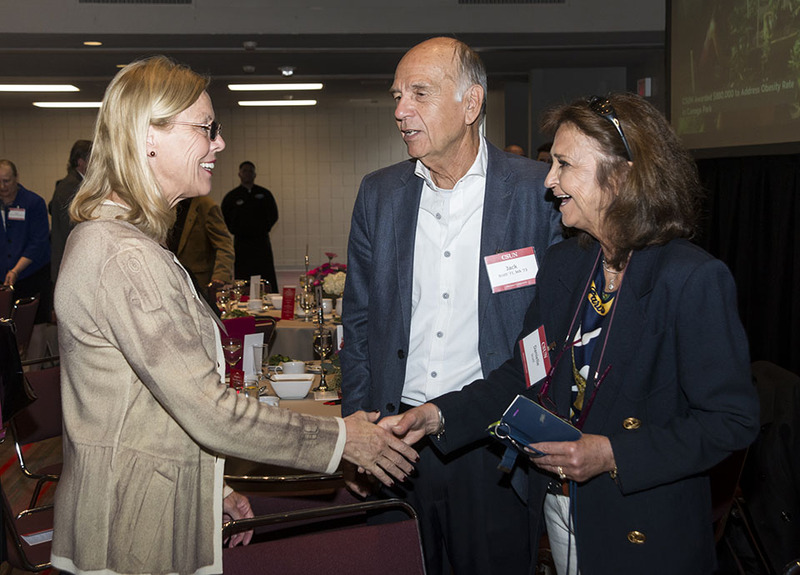 As if on cue, the sun broke through the clouds as President’s Associates and Heritage Society members gathered at the University Student Union, Northridge Center at California State University, Northridge to shine a light on student success. The annual President’s Donor Appreciation Luncheon, held on March 20, honored President’s Associates and Heritage Society members for their generosity in funding student scholarships, faculty, research opportunities and more. During the luncheon, CSUN President Dianne F. Harrison highlighted the importance of donor support, noting that CSUN acts as a “social elevator,” serving more students on Pell Grants than any other university in California as well as the second-largest number of Pell Grant students in the U.S.
“That’s important, because we want the state of California and beyond to continue to prosper, and to do that, we need citizens who are educated,” she said. Heritage Society Chairman David Malone ’81 (Accounting) introduced nutrition and dietetics student speaker Frida Endinjok, the recipient of the Christine H. Smith Endowment in the Marilyn Magaram Center for Food Science, Nutrition and Dietetics. Endinjok described her project, Let’s Grow Healthy, a community gardening initiative to decrease childhood obesity and promote healthy eating habits among kids in Canoga Park through hands-on, interactive gardening classes. “As a young mother, I wanted to break the cycle of unhealthy eating for my children’s generation — to show kids that food comes from the ground and not from the grocery store,” she said. “I am as passionate about nutrition as Dr. Smith was, and I hope that I can continue to follow in her footsteps.” Dr. Smith was a professor in CSUN’s Department of Family and Consumer Sciences for nearly 30 years. Anne Payne ’65 (Education), chairman of the CSUN President’s Associates, introduced English major Wyatt Samuelson, recipient of an Alumni First Generation Scholarship, who spoke about growing up in a highly dysfunctional family where education wasn’t a priority. After following a long road that included living under a tarp on a Los Angeles street and being removed from his mother’s custody, Samuelson finished high school on time and is attending CSUN — thanks to a caring foster family and donor-funded scholarships. The students’ stories were incredibly inspiring, attendees and staff said. 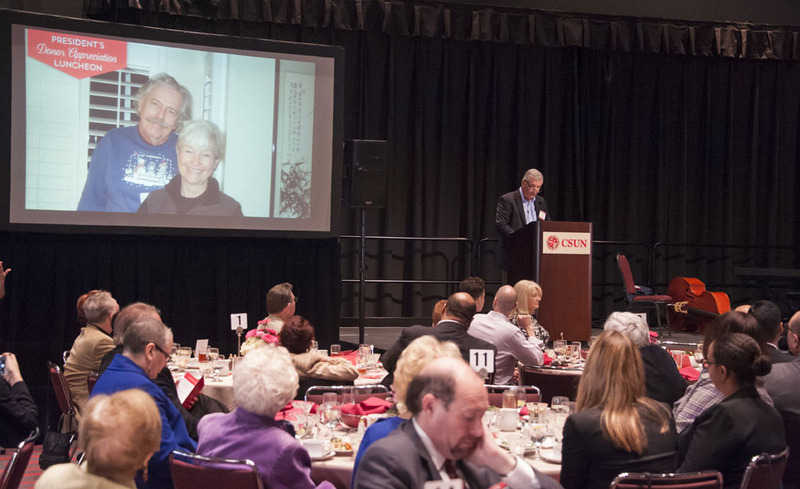 “Stories like [Endinjok’s and Samuelson’s are] what makes your investment so important and why we are so grateful for all you do,” said Robert D. Gunsalus, vice president of University Advancement and president of the CSUN Foundation, who announced that he had received an anonymous estate gift during the luncheon. 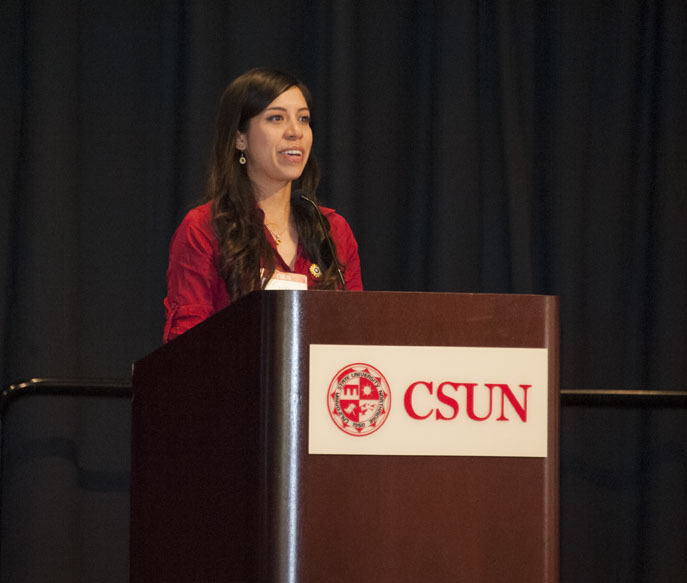 CSUN was a natural choice for Endinjok, as it presented opportunities to put her nutritional passion into practice, she said. “But much of what we do at CSUN and in the community would not be possible without incredible people like Dr. Smith, who support students through their time and financial resources,” Endinjok added.